Costa Rica Vacations – An Unforgettable Experience! For a licensed diver there are few places in the world that offer the rich underwater exploration and biodiversity of Costa Rica. While there are many sites that offer excellent diving few areas offer the clarity of view at depths that can be found in Costa Rica. The water is crystal clear with amazing visibility offering the seasoned diver (or even beginners) the opportunity to interact in a thriving oceanic ecosystem. And since scuba diving is one of the major tourism draws for Costa Rica there are not shortages of diving guides as well as instructors should visitors decide to pursue their PADI five star open water diving certification. Bahia Drake (Drake Bay) is located in the northern tip of Costa Rica and offers what most agree is the best diving in the entire region. It offers a small residential population and gorgeous lodges and all inclusive resorts. However given the remote location some services such as high speed internet can be intermittent and unreliable. Cell phones are also not able to be used in most locations in Bahia Drake. But it is for that reason (the remote location) that Bahia Drake offers the most amazing eco-diving opportunities . 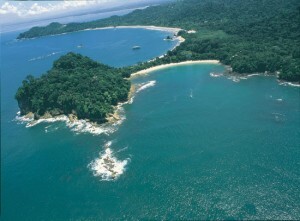 The famous Corcovado National Park (Parque Nacional Corcovado) is located in Bahia Drake and well worth the visit. It features the tallest rainforest canopy in the entire world and there is wildlife in the park that exists in no other ecosystem. It is a global treasure and the pristine oceans around the park are teeming with life making it an incredible dive location. Take a quick boat to the Island (it is only twenty kilometers off the shore of the mainland Costa Rica) for some incredible diving and underwater exploration. The area is historically significant as it is a burial site which dates back to the pre-Columbian era. The unique land mass was created over fifty million years ago and the ocean surrounding the island offers some of the bluest waters in Costa Rica with unencumbered visibility and pristine underwater plant and animal life. Given the variable depths of the water it is also an excellent location for snorkeling for the novice explorer and it also offers a variety of sea life including sharks and exotic fish. On the mainland of the island you can expect to see birds such as the black hawk and osprey, various species of reptiles and snakes, frogs, wild pigs and bats amount the local fawna. Boasting one of the cleanest and most quiet beaches in all of Costa Rica, Playa Ocotal is one third of a mile long with gorgeous beaches and crystalline waters for snorkeling or diving. There is a mysterious mist that surrounds the area (which is a combination of salt and fresh water mixing) that generations have believed to hold unexplainable healing properties. Given the rare beauty of the region accommodations are not economical and many tourists choose to visit for the day only. Costa Rica remains a gem as an area of amazing quality sites and locations. With a variety of other activities it is a favorite destination for professional and novice divers and offers an authentic engagement with the one of the best protected rainforest sites in the world.